5 who satisfies you with good so that your youth is renewed like the eagle's. I am learning to quilt. I started learning to quilt about two years ago and started with a queen size quilt which was a much to large project to start with. I am still working on it. Our teacher taught us how to make this quilt which came from a pattern in Easy Americana Rag Quilting by Annis Clap www.leisurearts.com. Cut two 9 x 5 inches out of each of the dark blues. One is your block and one is the backing of each color. Cut 2 pieces of batting 8 inches x 4 inches and place the batting between the two materials, leaving 1/2 inch space all the way around. Cut 2 9 inch square (one out of each of your two blues). Cut a piece of batting 8 inch square to go between the two blues. Stitch around the blocks using 1/2 inch seam allowance. Cut 16 (3 3/4 inch squares) of batting. Sandwich your batting between two opposite color squares. I laid out my squares in the following pattern. I then machine sewed around each square using 1/2 inch seam. Next I sewed an X across half of the blocks and a half circle on the others, as seen below. 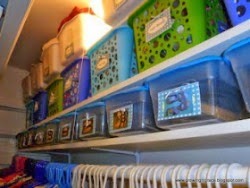 To do this I made a half circle out of heavy paper and sewed around it. After I have gotten all of the squares and rectangles sewed around and laid out the way I wanted them to be on the quilt, I began to sew them together. Putting two WRONG (or backs) sides of quilt blocks together, I sewed them together, then add another block sewing so the seam allowance is coming to the front of quilt. By doing this your seam allowances will be on the front of your quilt. The seam allowance becomes the fringe of the quilt. The back of your quilt will be smooth. Center and pin fabric and temp-let on blue large block. Stitch around sew lines to attach star to block. I tore the temp-let off the fabric, as seen below. You only have the star left. Next I attached this block to rows two and three, then to 1 and 4. Your quilt is all sown together. Now it is time to make the top and bottom trim. Cut 2 blue and 2 red strips 25 inches long by 1 1/2 inches wide. Also, cut 2 blue and red strips 17 inches long by 1 1/2 inches long for the side trim. Repeat the same process for the bottom seam allowance, as well as the side allowances. Press the material upward and away from the quilt. As you look at the quilt below you will see only the blue trim on the back side. of quilt. Trim quilt to be 25 inches wide top and bottom by 17" on each side, if need. Now you are ready to make your hanging sleeve. Cut a piece of material 23 inches wide by 6 inches long. Press under 1/4 inch on each end and sew a seam down each in so the ends will not ravel. Fold the material right sides together and make a quarter inch seam down the length of the material. Turn material right side out so the seam is on the inside of material. Pin the sleeve to the top of the back side of your quilt, 1/2 inch down. Sewn a seam width wise the quilt. I purchased a pair of snip scissors. This made the cutting much easier. This is what your quilt should look like when you have snipped all the 1/2 inch seam allowances through out your quilt, including the star. I am excited to have finished this Texas Star Rag Quilt. It is my first (of this kind) and I think it turned out pretty good. I am excited about making another one. It was pretty simple and relaxing. Once you have completed your quilt. Take it to a laundry mat to wash so as to keep your machine from clogging up with the strings that shed. The commercial machines are made to handle more than the home machines. ran my rod through the casing. 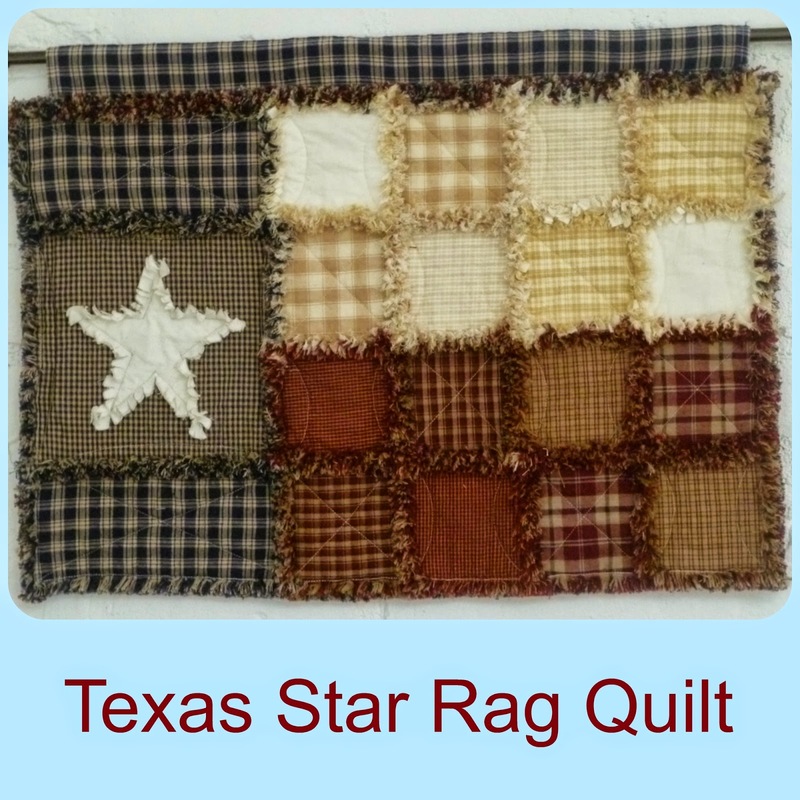 I am looking forward to displaying my Texas Star Rag Quilt for all to see.